Behold… the Holy Grail, Hodgdon Varget powder. Among all the rifle propellants on the market, Varget may have been the hardest to find in the last couple of years. 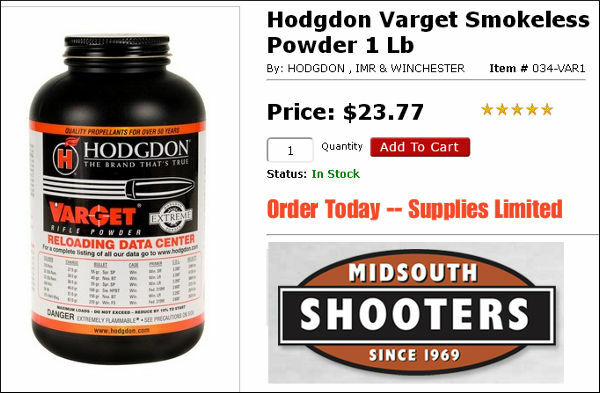 But take heart, Midsouth Shooters Supply and Powder Valley Inc. now have 1-pound containers of Varget in stock for immediate delivery. To get to the PVI order screen, from the PVI Home page, click “Powders” then click “Hodgdon”. 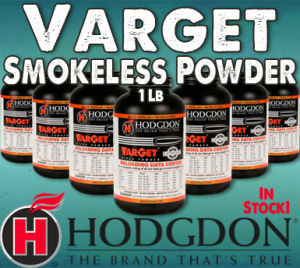 Over the years, Hodgdon Varget has proven to be one of the most accurate powders ever created. And it is also exceptionally temp-stable. In the .308 Win, 6mmBR, 6mm Dasher and other popular cartridges, Varget has set many records and won countless matches. It meters well (for an extruded powder) and can be used in a very large range of calibers and cartridge types. If you need Varget… don’t hesitate. Supplies are limited. This may sell out by the end of the day today..
TIME STAMP: This Notice Issued at 9:30 am EST Saturday, June 25, 2016. Share the post "Varget 1-Pounders Available at Midsouth and Powder Valley"
Wow! Varget at $23.77. That’s £17 odd in UK money at the official USD to PS rate, let’s say £19.00 at a retail exchange rate. We have an EU mandated sales tax called VAT which in the UK is 20% … so £19 X 20% = £22.80. Thats a good price for a 1 lb`er as it tallies to what the eight pounders are going for.